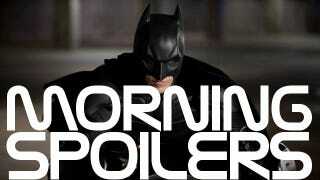 Christian Bale explains why Batman is an anarchist in The Dark Knight Rises! An acting heavyweight joins Ender's Game. Joss Whedon debunks the hot new Avengers rumor. Roberto Orci discuss the script for the Star Trek sequel. Fringe prepares for its first ever Astrid-centric episode. Plus there's a new photo of Karl Urban in Dredd! "For me he [Batman] is an anarchist and a free spirit. He knows that there are parallels between him and his enemies because life is never stable — you always have to fight for it. Keeping in mind that it may never be boring and that nobody is obliging you to behave like a superhero and to always have your muscles flexed and bulging." How long will you let the pain and loss define your life? Walking around chasing bad guys is very heroic and attracts attention, but at the end it all accounts for, as a means to deal with the pain of a huge loss." "Bane's mask is tight, actually. I got used to it, but you get used to anything really, in time...I didn't get into a dark place at all. A lot of dark characters are easy to have distance from, it's something I feel comfortable with, I suppose." "There is no Spider-Man cameo. But the Avengers do turn off the dark." I find it more than a little ridiculous that there are now teaser trailers for other, slightly longer trailers, but here we are, as Marvel has released a teaser for the upcoming Avengers Super Bowl ad. "You should know the story hasn't changed, the structure hasn't changed, and the action sequences haven't changed. Most changes are minor. The changes I suspect Quinto is referring to are the character interactions as we fine tune the level of their various friendships." "I'm hoping to be able to work with all those people again. It could be a franchise. It certainly is set up, plot-wise, for a sequel. But nobody's signed on for that just yet. We would like it to be [a film series.]" "I don't know. I think they're going to have to check it out. I think that the movie is going to be better than the first one. I think that Jon Chu has a younger, hipper sensibility. ['Rise of Cobra' director] Stephen Sommers is great, I really enjoyed working with him, but I think this movie is going to be a little hipper. A little bit more edgy." " I can tell you it's got a lot of dragons in it. It's got a lot of love and a lot of hate. But it's going to be epic. There's a scene in episode in ten which I'm very excited to see." Bomer: "I'm Team Alcide all the way but if I'm going to do a guest spot on True Blood, I wanna play a vampire." Manganiello: "I think Matt would make a great vampire," he agrees. "He's got the suit thing going on. He's got that sophisticated elegant thing going on." "I have a great storyline coming up," he tells us. "Next week you're going to see some fireworks between Sidney and the Evil Queen (Lana Parrilla)." Here's a sneak peek for this Friday's episode, "The Slice Girls." Additional reporting by Jennifer Griffith-Delgado, Ben Vrignon, and Charlie Jane Anders.